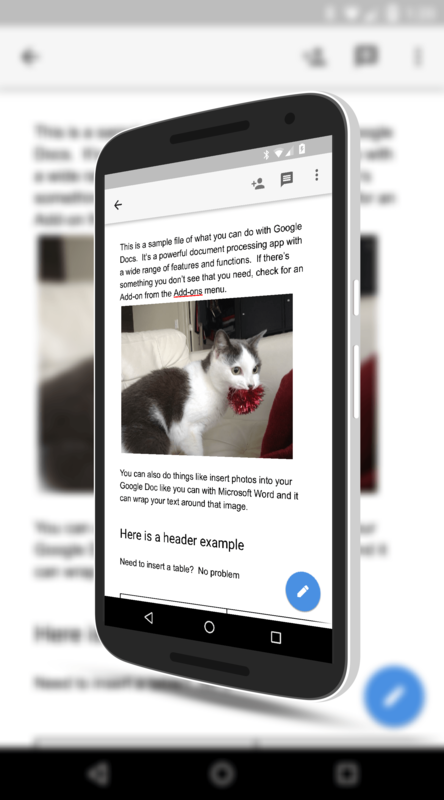 Following up on notifications coming to Google Drive, Google has announced that their productivity apps, Google Docs, Sheets and Slides, all have the ability to send you and you can control push notifications from the apps. The update to the three Android apps will be rolling out to the Google Play Store and should come to your devices over the course of the next three days. While push notifications themselves are not necessarily new to the productivity apps, how you control them is in this update. Previously, if you did not want push notifications from Google Drive, Sheets or Slides, you could only deactivate that feature from Google Drive. That is now no longer the case. With this update to each of the apps, you can now control the push notifications from within each app, saving you from having to navigate about on your phone or tablet to control them. It’s not a big feature change mind you but it is a smoothing out of one that was on offer. The other big change in the update comes to Google Sheets. If you use Sheets on the web you know that you can name a range of cells so you can track them or find them more easily. This is really handing in larger spreadsheets. With this update to the Android version of Google Sheets, you will now that the ability to do the same on your phone or tablet. Again, not a big change but an effort to have feature parity across all platforms. The updates to these apps will be coming via an OTA update if you have the apps installed and it could take a few days before they arrive on your devices. Once you have them, you can go into Settings on each app and adjust the push notifications for each app to suit your needs.